Figure 5. The lens in the eye changes its shape to allow you to focus on far and close objects. When the lens is relaxed, the normal eye is focused for distance (top illustration) and light rays from an object focus sharply on the retina. To see up close, the muscle that controls the lens contracts, changing the shape of the lens. This focuses the eye for close vision. If you’ve had good distance vision, you’ll notice at around age forty-five that you need to hold things farther away to read. The old joke is that your arms have gotten shorter. You can no longer read the menu or your cell phone. Most people get reading glasses at this point. If you have worn contacts or glasses, in your mid-forties you find that you need contacts plus reading glasses, or you need bifocal glasses. All of a sudden, the hassles with your vision have doubled. This section explains why this happens and what we can do about it. As I explained earlier, the eye is similar to a camera. When you take a photo of something far away, and then you take a photo of something up close, the camera must change its focus for the close shot. In the old days, the photographer would rotate the lens to refocus the camera. Nowadays, autofocus cameras refocus the camera automatically. Even with the autofocus feature, there is still focusing taking place; if you listen, you can hear the lens move as you point the camera at different scenes. The eye works the same way. The natural lens of the eye does the focusing. When you look at something far away, the brain signals the muscle that moves the eye’s lens to relax, which focuses the eye for distance. To look at something up close, the brain tells the muscle to contract, focusing the eye for close vision (Figure 5). All day long, in the normal eye, the lens is constantly changing its focus, without thought or awareness, to allow a person to see everything. As we age, the natural lens gradually hardens and loses its ability to change its focus. The lens in effect becomes stuck on a single focus. It’s as if the autofocus on your camera got stuck on distance focus. You can take photos of mountains and baseball games just fine, but photos of someone’s face across the table are blurry. It is important to note that, unless you are farsighted, presbyopia doesn’t impair your distance vision. Your natural lens gets stuck on the distance setting, so your distance vision doesn’t change. The lens’s ability to change the focus for close up is what is lost. Your distance vision normally stays good, but you need reading glasses to see close. The surgical correction of presbyopia is a complicated subject and will be discussed in detail in a later chapter. So far, we have been talking about distance and near vision. We need to be a little more precise (Figures 6–8). When we eye surgeons assess your visual needs after surgery, we think in terms of what you need at each of three ranges of vision: distance, near, and intermediate. Nonmedical people think of distance vision as applying to things farther than about twenty feet away. Eye doctors think of distance vision as seeing anything farther away than the fingertips of your outstretched hand. Even as a person ages and requires glasses for close vision, she normally can still see things beyond her fingertips clearly. Distance vision is used to drive, play sports, watch TV, and see faces across a dinner table. Near vision is used for seeing things at the distance you would hold a book, about fourteen inches away. Near vision is used for seeing your cell phone, reading a menu, threading a needle, and putting on makeup. 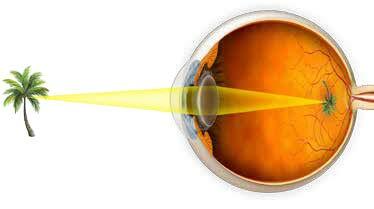 There is another important range of vision, called intermediate vision, which is in between distance and near vision. 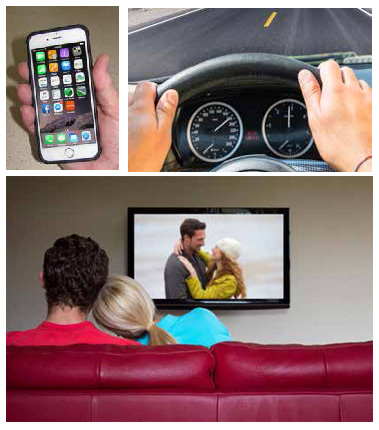 Intermediate vision is used for seeing things at fingertip distance on your outstretched hand, like a computer screen, the prices on the shelves in the supermarket, or the speedometer on your car. Distance, intermediate, and near vision are all important for optimal vision. As a person ages, he first loses near vision, usually around age forty-five, and needs to get reading glasses. He can still see intermediate objects like his computer screen. The lens in his eye continues to harden with age, losing more of its focusing ability. Around age fifty-two, intermediate vision gets blurry and he need to get glasses for computer use, too. Earlier paragraphs describe what happens to people with perfect distance vision as they age. Maybe you didn’t have perfect distance vision to begin with. Likely, you were myopic. Being nearsighted, you never could see well far away, but you always could read without glasses. So what happens to you as you age? After the age of forty-five, when you are wearing glasses or contacts, you still have excellent distance vision, but you’ll find you can’t read well with them. In effect, the glasses and contacts simulate normal vision, so, just like a forty-fiveyear- old with farsightedness, reading becomes difficult. At that point, you have a couple of options. You can wear reading glasses with your contacts. You can get bifocal lenses, which are glasses with a distance correction in the top half of the lens and a reading correction in the bottom half. The third option is to take off your glasses or contacts to read. Because you are nearsighted, you can see close up without glasses. Then put your glasses back on to see far away. This option works for some people but not others because their nearsightedness is often either too much or too little for optimal reading vision. Farsightedness (hyperopia) is often confused with presbyopia because both impair near vision. 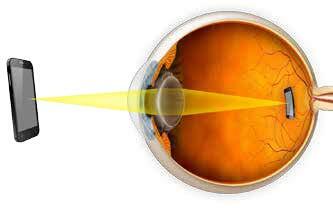 Farsightedness impairs near vision because the natural focus of the eye falls behind the retina. Presbyopia impairs near vision because the lens is too hard to focus up close. The combination of presbyopia and farsightedness is a double whammy to near vision as we age. If you are young, hyperopia isn’t too much of a problem. The focusing power of the natural lens when we are young can often overcome farsightedness, so you can see well both far and close. As the natural lens ages and hardens, it gradually loses its ability to compensate for the farsightedness. If you are hyperopic, you lose your reading vision earlier than other people, perhaps in your early forties. You get reading glasses. Then, as you get into your late forties or early fifties, you notice blurry distance vision, too, as the natural lens loses all ability to compensate for the farsightedness. At that point you get bifocals. The exact ages vary from person to person but the pattern is nearly universal in hyperopic individuals: good overall vision in youth, followed by a gradual loss of near vision, and then later by a gradual blurring of distance vision. Glasses are often particularly frustrating for farsighted individuals because they never got used to them when they were young.